As smartphones go bigger and bigger, and tablets get smaller and smaller, there are a few companies unafraid to go the other way. Joining the likes of the Sony Vaio Tap 20 and Asus Transformer AiO, Dell will be shipping its own monster 18.4-inch tablet, the XPS 18, next month on April 16th. Sure, you could snag a Windows 8 desktop if you want, but why trifle with a stationary terminal when, for just $899, you can carry around a mongo touchscreen device using Microsoft's latest OS? This hybrid tablet/desktop boasts a few specs that give full computers a run for their money, including a choice of i7 or Intel Pentium processor, up to 8GB RAM, and a large hard drive, plus a five-hour battery. (While that's not a huge amount of run-time, it's respectable given the screen size, processor and touch display.) It features a slim aluminum frame that's just shy of 18mm thick, which weighs a little more than five pounds. Though a bit hefty, it still qualifies as portable, and it allows for myriad positioning options for the 1080p touchscreen. The two magnetic legs in the back unfold to allow for three different positions/angles. Or users can place it on the optional tilting $49 metal charging stand dock for even more viewing angles. Like many tablets, the device has a 3.5mm headphone jack, SD card slot, Wi-Fi and Bluetooth 4.0, but it also includes two desktopworthy USB 3.0 ports and a set of dual speakers that crank out more sound than your average tablet. And to top it off, the XPS 18 comes with a 720p webcam and dual microphone for all the vid chat goodness you'd want in tablet or computer. The base price of $899 includes an Intel Pentium processor, 4GB RAM and a 320GB hard drive, but customers can also upgrade to a Core i7 and solid state drive. 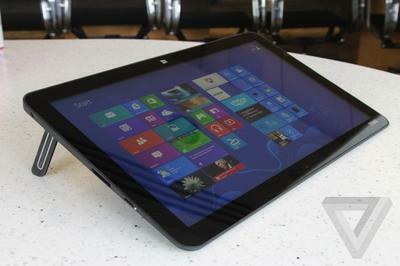 The Verge's hands-on indicates that the XPS 18 tops the Sony Tap 20. And at much less than the $1,299 Transformer AiO, it's definitely a more affordable option than some of its competitors. But can it help cement this category-defying niche and make an attractive use-case argument for consumers? We'll have to see. What do you think? Is there a hidden demand for a tablet/desktop hybrid? Are you interested in this or one of the competitors? If so, what would you use it for? Tell us in the comments.